A couple of Saturdays ago, i went up to Launceston for the 2007 Synod (Anglican church parliament). This was the big one for youth ministry in our diocese. We managed to get our vision, framework and strategy up and Ministry Council was asked to look at funding and implementing the recommendations from our youth task-force. I must say i found it highly satisfying, after a year of hard work and a lot of thinking it would be too hard. I still think we have a long way to go before the Anglican church is anywhere near where it should be in its ministry to young people in Tasmania. But we've definitely made some strong first steps. 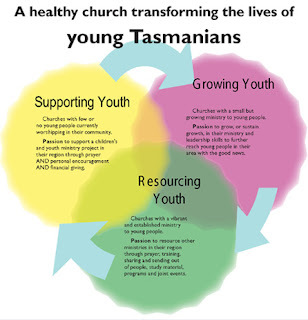 At Synod 2007, key decisions were made to grow ministry with young people in parishes around Tasmania. In 2006 Synod heard a dismaying report about the parlous state of Youth Ministry in most parishes. There was a groundswell of support from Synod for action, and the Bishop asked the report presenter Chris Bowditch to form a Youth Taskforce. Over the past 12 months this Youth Taskforce developed a model to support, grow and resource youth ministry involving every parish, and presented to Synod a strategy to implement the model. Synod heard about some of the good work going on through Anglican Camping, in our Anglican schools, through chaplaincy in state schools and in Mission Afloat. However, these valuable ministries for the most part remain unconnected with local parishes. The Youth Taskforce presented a 3-part strategy to see parish youth ministry grow over the next 5 years, and the number of parishes with healthy youth ministries doubled. Seed money to employ Youth Ministry Trainees in 4-6 parishes around the state. These may be 'apprentice' leaders working 2-3 days per week in parishes where there is the start of some youth ministry, but where additional resources and leadership skills could be expected to make a big difference; or the assistance may be used to support a parish to move from part-time to full-time, or from trainee to trained levels of youth ministry leadership. Parishes would raise new money to add to these grants. Training, both of these apprentice youth leaders and volunteers, plus extra training and support for the ministers or others supervising them. Diocesan Support from an experienced youth minister working 1 day per week for the Diocese in each of the North and South of the State, perhaps employed for the remainder of the time as a parish youth or associate minister. These people would promote Youth Ministry around the Diocese, and oversee training. Synod voted strongly to commend the work of the Youth Taskforce, directing the Ministry Council to fine-tune and action this strategy, and for Diocesan Council to investigate the financial resources needed. Please pray as the real work begins. Yay for more youth ministry. Ohh.. and they should give all current youth pastors new Subarus too. Yeh. New Subarus. I'll have a Black STI please Diocese of Tasmania..